Wizard of Oz fans have been waiting a long time for this one! This is a simple three dimensional craft that is fun for kids to make and play with. You can use Aluminum foil instead of the template piece to cover the toilet paper roll. Just keep in mind that it's a bit harder to glue things to Aluminum foil. 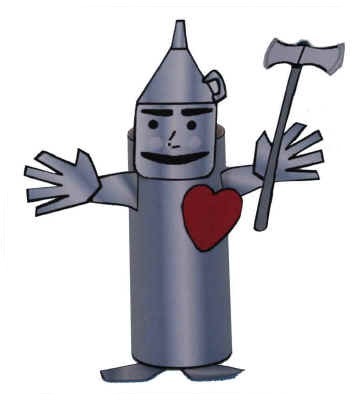 Glue the heart onto the center of the tin man's chest or into one of his hands. Bend the tabs (dotted) of the feet and glue to the inside of the toilet paper roll.